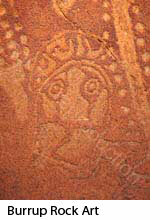 Grafico Topico's travel writer Monsieur Flaneur dons his akubra hat and explores Australian Aboriginal Rock Art. 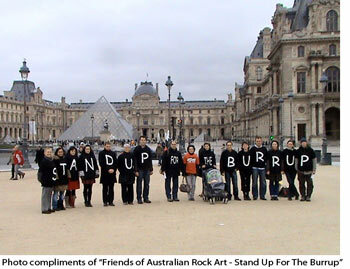 MES AMIS, Flaneur's appetite for Australian Aboriginal art began quite by chance when he stumbled across this curieux group (pictured left) in his very own ville in 2008.
Who were these so intriguingly folkloric-costumed personnes, he wondered, so eagerly ready to man the barricades ... pour qui, one wondered? Flaneur ( whose conception of rock art, he would be the first to confess, sadly, was limited to a dim memory of a faded school text picturing fat dun-coloured equines prancing on the walls of Lascaux ) rushed out immediately to la bibliotheque -- and was enchanted to discover the rich mystic world of les ancienne Aboriginenes, replete with slender hunters pursuing the most amazing menage of kangaroos and other animals known only to the great southern continent. But cher lecteurs, why would one settle back in one's chair for information from tomes when it is entirely possible to travel to the actual sites of these great wonders -- and to experience an expansive world of endless land and sky at the same time. 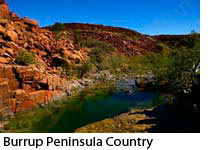 If you may be tempted to explore the wonders of Aboriginal rock art yourself, from July 23-30, 2011, there is a guided tour from Karratha (1500km north of Perth in Western Australia) to the Burrup Peninsula. 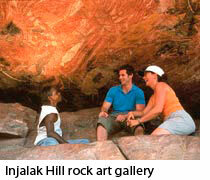 The tour provides introductions to expert archeologists and Aboriginal custodians for a unique cultural experience. 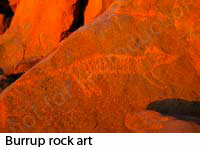 There is a wealth of Aboriginal rock art in the Northern Territory, and there is an eight day tour of ancient art and sacred sites organised through the Northern Territory tourist organisation "Territory Discoveries".